For a truly unforgettable experience of a lifetime, Arrifana Surf Lodge welcomes you to join Aldo and Sarah for a more personal surfing experience. They are dedicated to bringing you awesome surf tuition, great food, comfy sleeping quarters, a relaxed atmosphere, and a whole lot of fun! At Arrifana Surf Lodge, they really are a home away from home. The property is new with four large private guest bedrooms, one shared room, and three large guest bathrooms. The large bunk room with en-suite bathroom has a custom built bunks with individual reading lamps and built-in storage. This room sleeps a maximum of six people. The lodge has a shared lounge and kitchen facilities and in the winter, they even have a roaring fire to keep you warm and cozy. There are two huge terraces with views out to the Atlantic Ocean where breakfast and dinner are served daily. Arrifana Surf Lodge prides themselves on great homemade cooking and plenty of barbecues. Arrifana Surf Lodge offers great features in their accommodation such as plunge pool, yoga terrace with mats, two hammocks, sun loungers, outdoor bean bags, computer, TV, free Wi-Fi, free use of bicycles, and unlimited tea, coffee, and fruit juice. Directly opposite the lodge, there is a typical Portuguese bar and within walking distance is a mini supermarket. Within five minutes walk of the lodge are two restaurants specializing in piri piri chicken and at Arrifana Beach, there are many great seafood restaurants including a beach bar located right on the beach. During your stay with Arrifana Surf Lodge, you are sure to visit one, if not all of the three beaches listed below. These beaches are all within 10 minutes drive of the lodge and are the main beaches they use to hold their surf lessons. The waves can differ on each beach depending on swell and wind direction. They have listed below what conditions work best for each beach. Amoreira is Monte Clerigo's sister beach due to the proximity of their locations. Amoreira works on the same conditions as Monte Clerigo, but due to the river that creates a beautiful lagoon, the banks at this beach vary from that of Monte Clerigo creating different waves on different tides, thus making it a great alternative to Monte Clerigo. A west-facing beach that works best with a north-northwesterly swell with a north to the northeasterly wind. Due to the direction that Arrifana is situated, it has protection from big northerly swells and can hold swell up to three meters. Monte Clerigo is a great summer break due to it's northwesterly facing position. It receives all swell from the Atlantic Ocean and works best on a south to easterly wind. You will always find a wave at Monte Clerigo when Arrifana is flat. You will have 60-minute yoga session from April to October. One of the founder's and the head instructor at Arrifana Surf Lodge. Aldo was born in South Africa and has been surfing for over 17 years. Aldo is also an experienced surf instructor with a level 2 surfing degree from the International Surf Association and the Portuguese Surfing Federation and he is also a trained and qualified life guard. Mandala has been surfing more than 20 years now. He is instructing surf since four years ago but he brings in his luggage the pedagogic skills from teaching music since a long time ago. He is qualified with a level 2 surfing degree from the International Surf Association and the Portuguese Surfing Federation. Braulio has been in the water for the last 25 years. He has been lucky to have always lived near the sea. As a youngster, he was always seen playing at the shore rolling on the foams, first bodysurfing, and after a time with a boogie board. He is qualified with the Portuguese Surfing Federation. He is also a trained and qualified life guard and first aid. Situated in one of Europe's most beautiful nature parks, Aljezur has everything for either a 'laid-back' or an active holiday. Discover and enjoy the hospitality of the people, the Algarvean cooking, the beauty of this natural park (not yet spoilt by mass tourism), and of course, the wonderful weather. Aljezur is about 30 kilometers north of Lagos on the N120 and is situated in a lush, green, fertile valley that the area well known for its sweet potato crops. It is built on either side of the river that runs through the valley while the old town being on one side and the new town on the other. The remains of a Moorish 10th-century castle can be seen high on the hill over the old town. The views from there are fantastic! Legend has it that the Knights of Santiago under Dom Paio Peres took the castle without a fight one night in 1249 when a Moorish maiden opened the door and let them in. Arrifana Surf Lodge is nestled in the quiet village of Vale Da Telha in the Costa Vincenta National Park located less than five minutes drive from Arrifana Beach and only 20 minutes on foot. They are less than six kilometers away from the charming white-washed hillside town of Aljezur. Located on the southwest coast of Portugal, the area receives a consistent year-round Atlantic swell, making it one of the best places in the world for surfing. There are lots of lovely white sandy beaches, perfect for beginners, as well as challenging point breaks and reef breaks for the more experienced surfing crowd to be explored. All the food served at Arrifana Surf Lodge is homemade using the freshest ingredients possible. They know how hungry surfers can get after a long day spent on the beach and in the waves, so they always offer a three-course menu five nights a week with the option of dining out at some great local restaurants the other two nights. Continental breakfast is served daily and includes a selection of cereals, fresh milk, yogurt, fresh bread, jams, honey, homemade nut butter, ham, cheese, fresh fruit, and eggs any way you like. Lunch is provided Monday to Friday and includes two freshly made rolls with the filling of your choice, fresh fruit, cookies or chips, and water. Evening meals are provided on Sunday, Monday, Tuesday, Wednesday, and Friday. There are no meals provided on Thursday and Saturday. Guests also have the option to use the kitchen facilities at the lodge during nights where no meals are served. Check out a sample of their weekly menu. Pommpadoms and mixed pickles with chutney. Dal, sag aloo, and chicken bhuna are served with pilau rice and homemade chapati bread. Selection of Portuguese cheese. Barbecue chicken, ribs, sausages, roasted veggies with quinoa, and stuffed peppers are served with potato salad, corn on the cob, braai brekkies, sweet potatoes, and house salad. Fresh tomato, mozzarella, basil salad, homemade bruschetta with balsamic dip, homemade veggie and beef lasagna, and spinach and ricotta cannelloni are served with garlic bread and house salad. Dessert is tiramisu. Hummus is served with toasted pita bread and roasted veggies, homemade veggie black bean and 100% beef burgers served with homemade oven chips, coleslaw, caramelized onions, and all the toppings. Dessert is hot fudge sundae served with Sarah's homemade ice cream of course! Mixed tapas, barbecue grilled dourada (sea bream), and veggie paella are served with house salad, Algarve potatoes, and fresh crusty loaves. Dessert is white chocolate brownies served homemade ice cream. When you exit the airport, you want to follow signs towards the highway A22 towards Portimao and Lisboa. Keep following the signs until you get on the A22 and take the Portimao and Albufeira direction going west. Follow the A22 all the way to the end past Albufeira, Portimao, and Lagos. You will see a turn off for the N120 Aljezur and Sines when the highway ends. You will remain on the N120 for approximately 20 kilometers. Just before you get to the town of Aljezur, you will see a turn off on your left for Arrifana Beach and Vale da Telha. Turn left at the sign and follow the road (steep hill) until you come to the top of the road (T junction) and take a left towards Arrifana and Vale Da Telha. Keep on this road for two kilometers. You will come to the tiny village of Vales. Directly after Vales, there is a turn off for Vale Da Telha on your right. Turn right at the signpost for Vale Da Telha and immediately take a left. You will pass an old school on your left and a builders merchants on your right. You will come to a roundabout, turn left at the third exit to Arrifana Beach. Follow the road (very short distance) until you come to a set of large flats. Turn right on the road before the flats and Arrifana Surf Lodge is the second house on the right number B58. 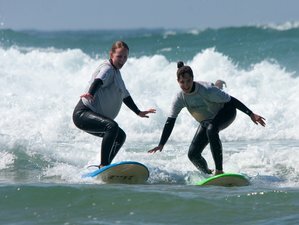 Arrifana Surf Lodge is a family run surf chalet offering surfing, yoga and yummy organic meals. The package is 25 EUR cheaper if you bring your own equipment and you will get a 10% discount if you book on second week.